Lodging: Lodging will be provided at one of our local hotels that offers free wi-fi and meals. Meals: Your meals will consist of breakfast, light lunch and full dinner. Prices does not include gratuity. Within 14 days of booking, a deposit of $100.00 is required per gun. The balance will be paid at the end of your hunt. � Shotgun - 12 or 20 gauge is common but smaller bores are welcome. � Clothing - Bring cold and warm gear with you. Its Arkansas Things change quickly. Come prepared to hunt no matter what! � Shotgun Shells - A heavy 1 1/8 or 1 � shell is common with shot size of 4, 5, or 6. � Coolers for your birds. � Hunters orange vest, coat, and hat are required. ** Your dogs are welcome as long as your hunting party approves. Remember your dogs mistakes are your responsibility. Members of your hunting party might not appreciate to seeing their birds flying away - flushed in the distance. 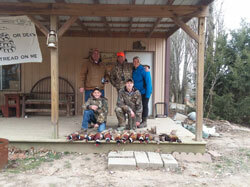 A typical trip to the west to hunt pheasants would cost approximately anywhere from $800 to $1850 for a three day hunt. Note: Everybody wants to hunt wild birds but when that bird gets up and you cannot kill, it does it make a difference. We guide for both wild and game farm birds and each day I see clients always getting more shells because they cannot hit either bird. 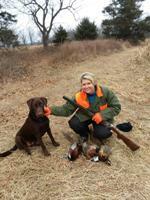 Lodges in both Kansas and SD release birds to keep their up population up. for more information or to book one of these packages.